We all have difficult and stressful days, but actually making time to go get a foot massage is completely out of the equation for most. uComfy is a brand that aims to solve such problems with their range of products designed to help relieve stress and calm the body. Amongst all other products, they also hold a line of foot massagers. One of the easiest ways to relieve stress and to get rid of that tension from the body is to get a massage, namely foot massages. The reason being, when your feet are relieved it somehow can drain all the stress from the rest of the body, leaving you relaxed completely. 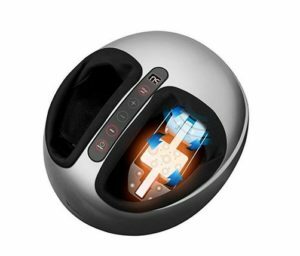 The uComfy Shiatsu Foot Massager works by circulating hot air around the feet, while the Shiatsu Massager 2.0 has many levels of massage intensity modes and styles to let the users customize for their own needs. The Ucomfy 8954 massage machine comes with auto self-timers to make treatments more manageable for the users, while the model 8072 works not only on the feet but all the way up to the calf and ankle as well. All these models are very different and unique in their own separate ways to meet the needs of different users with various problems. But they all carry the basic treatment techniques so anyone can get used out of them. Since an excellent feet and leg massage machine is all we need to let go of all that stress, it is crucial we get one that meets our requirements to the fullest, and the uComfy Shiatsu massage machine with Heat is one that does not disappoint. 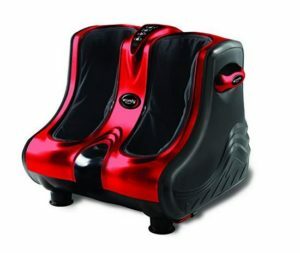 This foot massager comes with multi-level settings which makes this product very versatile and customizable. This product features shiatsu therapy, which is essentially applying force to the pressure points on the body to help heal and provide relief. The unit also sports a heated air massage which helps to keep the tootsies warm during the massaging sessions, rejuvenates the legs and enables you to experience the true spa-like treatment. Unlike a lot of other massagers, this one truly stands out for its massaging techniques on both the top and bottom of the feet. The massage is applied by the rollers which deliver a deep kneading motion to provide relief, while the vibrations help break the stiffness in muscle and tendons. These massages help you breathe more easily and improves your respiration, not to mention speeds up the blood circulation as well as improving blood pressure and releasing pain from the tired and worked leg muscles and aching feet. Another pro about this machine is that one does not need to put on socks since it comes with a cloth itself, which is also washable. When it comes to cons, this product may not be the best choice for those who want a treatment every day. It is designed for occasional use. Also, it does the job only for small feet, and might not be as comfortable for bigger foot sizes. Customers who have bought this device have said that one standout feature is that you can turn off the kneading motion from the rollers to just have the vibration and air pressure, which delivers a lighter massage. With the uComfy Shiatsu Foot Massager 2.0, all one has to do is really just sit back and enjoy the session. This model sports 5 intensity levels intensity to increase versatility for the user. Often without proper intensity knowledge a lot of users end up hurting their feet, and this particular setting is to prevent that from happening. This means on days when you require a heavy massage just change the settings, and on other days when you need a milder one, adjust them again. Next, this model has 2 different treatment styles which are the kneading shiatsu-style massage and the vibration-style massage. Users can choose to make use of both the options together or separately. It also has a heating option which helps loosen up the muscles. One can also control the amount of heat and air pressure they want. This oval model makes use of reflexology by using acupressure which surrounds the feet and distributes and even compression. The heat combined with compression from all sides is what really helps to get those muscles working again. Another great advantage of this model is that it can be washed, and the foot covers removed for hygiene. It is also built with durable materials with a rubber stand which helps it stay locked in place during use. Customers who have bought the machine state it is an awsome purchase, and love the squeezing pressure on the legs, not to mention being able to change the settings so easily. This machine although great is not built for big feet, and discomfort might be experienced if you use it with larger feet sizes. At 12 pounds of weight this model is not very portable. The Ucomfy 8954 Massager feature a dual mode kneading and vibration technique. The four flexible kneading disks help to work your calves and ankles, while the pressure node helps stimulate your reflex points on the soles of the feet. This machine sports three-speed levels and three intensity settings. One great pro about this machine is also its 15-minute auto shut off timer, and that it comes with handles which make them easy to carry, something that cannot be seen as much for such devices. The treatment targets sore spots of the feet with 16 airbags that can inflate and deflate to deliver a deep massage from the soles to the calves. What makes this massager unique from the rest is its use of air pressure instead of nodes, which exert just the right pressure without hurting your feet with all the hard and harsh plastics. The uComfy Leg, Foot, Calf, and Ankle Massager is designed to not only massage the feet but all the way up to the calves and ankles as well. This machine features flexible kneading disks which work to massage the calf muscles and ankles, while the pressure nodes help to stimulate blood circulation. The dual mode of kneading and vibration being customizable is great for ones who look for versatile products. This too sports three-speed levels and three intensity settings along with a 15-minute timer. As for the cons, most customers complain about the high price point, and that their devices did not live long. Both models are very similar in their specifications, except for the fact that the model #8954 has heat. Reviews from users are mostly negative for both the models primarily because they did not perform up to mark, and the price points were very high, which made users prefer a spa over the machine. 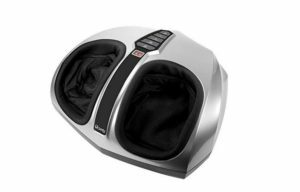 Both have been discontinued, but the Giantex Shiatsu Kneading Rolling Vibration Heating Foot Calf Leg Massager is an excellent alternative with similar specifications. Overall the uComfy Shiatsu Massager 2.0 is the best choice for customers because of its multi-level settings and versatility, not to mention its two styles of kneading and vibration. What makes this product better than the rest is that the pressures and heat that comes from it are very even. Unlike the other models, this particular one is said to be very long lasting and has almost no bad reviews at all. It is washable, making it hygienic and also very comfortable and relieving on the feet without having any external problems, which is what everyone looks for.